I wonder how you sleep at night, because I am, honestly, having a tough time sleeping peacefully these days. I have visited Tharparkar a few times. And every time I came back, it took me a long time to get the images of Tharparkar out of my system. You and your government, Sir, have visited one too many times. These people have voted for you and trusted you. I wonder how you get those images out of your system. I will not be unfair. So I have to say that visits to interior Sindh have told me enough to say that yes, you and your government did try to make things better for these people at some levels. There is the Benazir Income Support Programme (BISP), the Lady Health Workers (LHW) program, a more women-friendly legislation and a few scattered silver linings. But were they really enough? And in particular, for Tharparkar which was already a ticking time bomb of impending doom due to food insecurity and lack of water, did you all do enough? Travelling to Tharparkar, one sight that was amazing was seeing flags of the political party they all love on their small, circular homes. Inside the circular homes, there would mostly be pictures of their local leaders from the same party, bleached out due to the intense Thari heat. “But are you satisfied with the work they have done?” I had asked. The loyalty was something I couldn’t fathom with my city-centric sensibilities. But they did vote for their elders. Are their children paying a price for that loyalty? Perhaps the answer is, yes. Listening to the breaking news about the many lives of little children snuffed out before their time, I have those images in my head again. Because I know that these children did not die in a day… they were dying all along. Even the new born ones. They were dying because their mothers have a history of weak bones and malnourishment, because they get to drink brackish water laden with fluoride and their average meal is sun-dried red chillies crushed to a paste with roti that is not enough. These children, who are dying, are born to mothers who have mostly lost more than one baby because they have to travel on camel backs in full term pregnancy if they need a caesarean section delivery. The nearest hospitals, Sir, are too far. The vaccinators who are unsung heroes carry the vaccines on foot in the unbearable heat, but mostly the ice that keeps the vaccines fresh melts by the time they reach their destination. So the mothers mostly do not get tetanus vaccines on time and die from septicaemia because they have contracted infections by delivering children on the sand which is a Thari tradition. The children do not get vaccinated for deadly but preventable diseases. 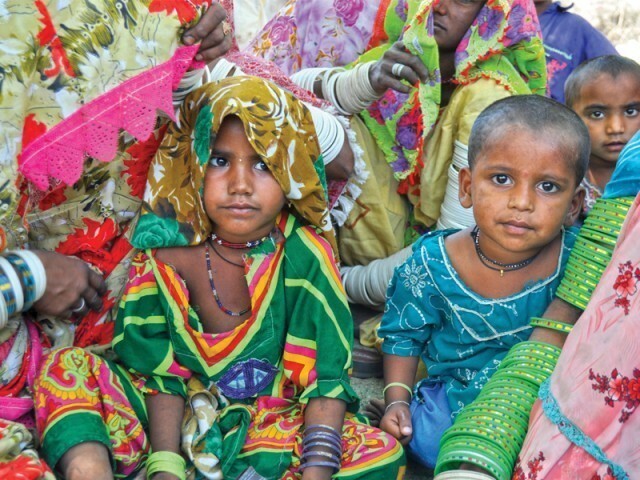 The NGOs struggle to make things better in Tharparkar but they do not have enough support from the government. You, Sir, and your government have known this all along, haven’t you? This wave of donations is only reaching Mithi which is like a model town at the minute. The real issues are still prevalent in the small villages. Who will solve their problems, Sir? Visiting politicians in Mithi for whom lavish meals are lined up do not know the pain of someone in small villages like Maghoo Bheel where donations may never reach. These politicians also do not know how those standing in queues for hours to be handed a bag of grains are beaten with sticks or ridiculed by those distributing the donations. You do know that what is being called a ‘drought’ or ‘famine’ is no doubt a natural calamity. But it is not like the floods or an earthquake. This is a natural disaster of which the death toll can be mitigated. But sadly no one takes notice. This disaster is related to lack of clean drinking water, Sir. I wrote a story last year about just one such village where the entire population walks with spines bent or crawls on the floor because the water they consume is too little and unfit for human consumption. Without a word of exaggeration Sir, I called your office every day for months to get a single 15 minute appointment with you, so that this issue could be brought to your notice; all that village needed was an electricity line that could run a water filtration plant that someone had donated to them. The people of the village kept writing to you. Promises were made. In protests. On Twitter. But it was not taken seriously enough. You must have seen Thari children, Sir, running barefoot in the desert sand or sitting in a weak looking mother’s lap. They are stunted, mostly, and look much younger than their years. Their Body Mass Index (BMI) is clearly under the required level. Their hair is brittle and their skin is parched. They cry in weak voices for no reason. Their bellies are too large for their body. Their Mid-Upper Arm Circumference (MUAC) when measured tells health officials they are at a risk of dying. The NGOs give the extremely malnourished ones high-energy food supplement biscuits. But because the entire family is so poor and food insecure, they all end up sharing it. And so, that malnourished child never regains health because his supplement is shared, morsel by morsel, by the entire famished family. Some of these malnourished children will grow up to be mothers. They will give birth to weak, sick children. And unless someone steps up, this cycle will go on. The donors who are donating excitedly right now will soon get exhausted after media stories die out. Donor fatigue will set in. Politicians will go back to their comfortable homes. And mothers in Tharparkar will continue to mourn over their dead babies. Just this once, can we do something lasting, Sir? 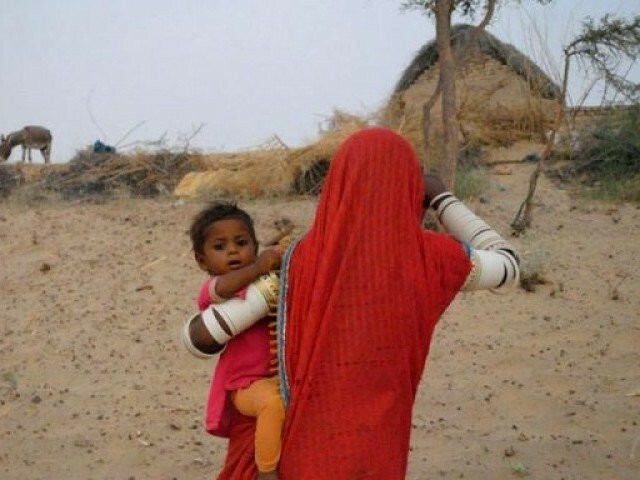 Posted in Human Rights, Pakistan and tagged Chief Minister Sindh, drought in Tharparkar, Express Tribune, Express Tribune Blogs, famine in Tharparkar, Qaim Ali Shah, Tharparkar. Bookmark the permalink.